Proceeds from the fifth annual Wayne Community Church auction will benefit the Winthrop Food Pantry and other charitable organizations and programs. WAYNE — That two-piece leather sofa will help pay for fuel for someone’s furnace, the boat ride on Androscoggin Lake will turn into a luncheon for seniors, and the handmade quilt will buy games for the afterschool program and winter game nights. 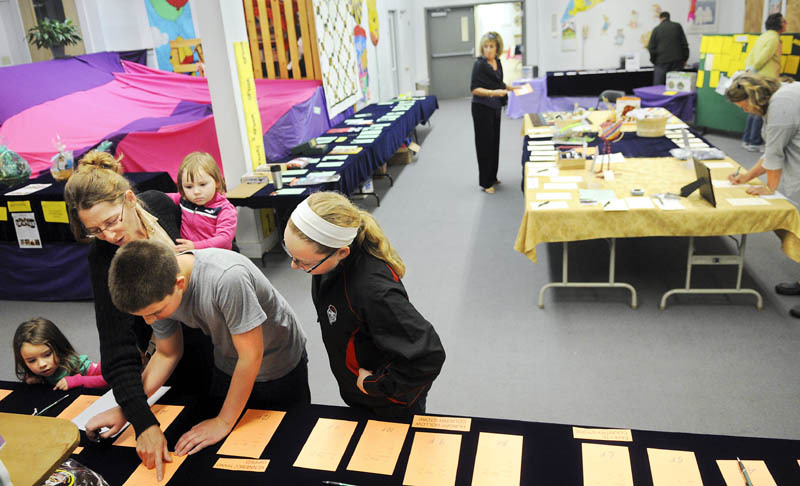 Wayne Community Church’s annual auction, now in its fifth year, is a key source of support for the Methodist church’s outreach programs throughout the year. Proceeds from the auction, which continues at the church daily through Saturday, culminating in a live auction and barbecue at 6 p.m. Saturday, go into the church’s general budget to help with community service programs. Wayne Community Church supports the Winthrop Food Pantry, provides lunches for children when school’s out and runs a gift program in December. Proceeds from the auction also will go toward things such as assistance with medical expenses and operating the nursery school and after-school program, White said. Last year’s auction raised $13,000, said Carol Ladd, one of the organizers. The organizers are highlighting dozens of items made in Wayne or in nearby towns, such as a cherry side table made by Robert McKee, a pet portrait by painter Dawna Gardner, and desserts baked by several town residents. Sue Faulkner, a summer resident who helps organize the auctions, said bidders like the local products. Her husband, Mike Faulkner, said it takes a lot of phone calls, but is not difficult to find businesses and individuals who will donate to the auction.